Readers, do you usually avoid buying second hand trousers that are too large for you? Would you have someone adjust trousers for you, or would you feel confident to adjust them yourself? So I thought I'd give it a shot myself, and it worked, and now I have an amazing fitted pair of bootleg floral trousers. 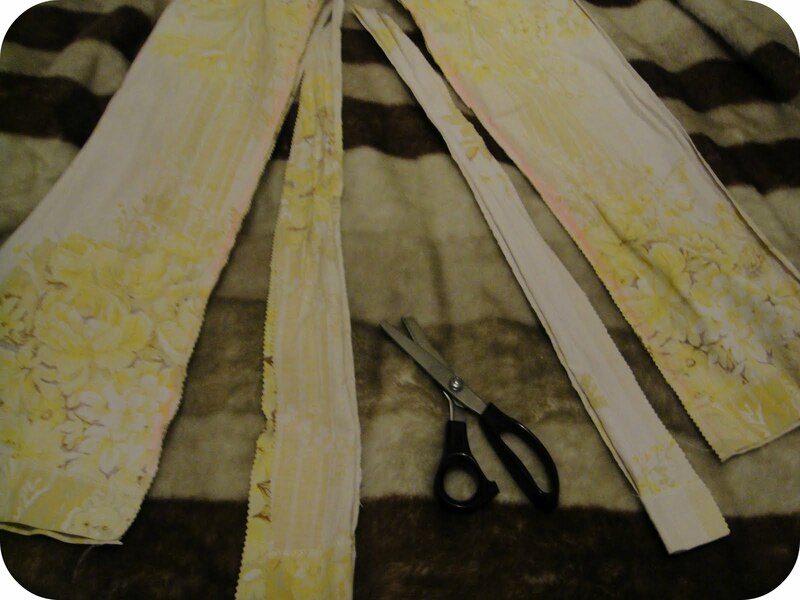 Step 1: Find suitable shape pair of trousers (in my case a pair of bootleg jeans), turn the pair of trousers you are altering inside out, lay jeans on the top with the outside hem matching up. 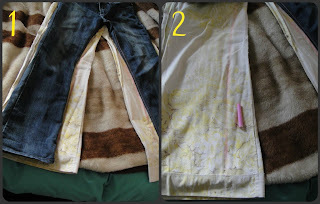 Step 2: Trace around outline of jeans (or trousers you are using as a guide) with chalk. I don't have tailor chalk, so I used ordinary coloured chalk, in this case pink, that would be visible on the fabric. Then sew all the way along the chalk line starting on one leg at the bottom hem, up and across the crotch and down the other leg. Step 3, cut: At this stage I tried on my trousers before cutting, to ensure they were not too small. Once happy with sizing, I used pinking shears to cut off excess fabric from stitched line. Step 4, back darts: My trousers were still too big around my waist, and instead hung too low around my hips, so I adjusted two existing back darts. Another tutorial to take in the waistline of trousers by adding back darts can be also be found on C&C. 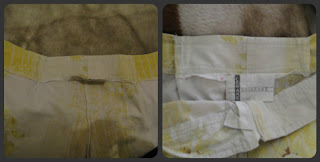 The pic on the left shows two back darts already stitched which suggests the previous owner adjusted the waistline too, therefore all I had to do was make the two darts larger (pic on right). I feel fairly confident to re-size larger sizes smaller in future, which opens up a whole new world in sourcing second hand trousers, as I will not be limited to selecting one size. I thought I had seen those pants before! You have now made them completely wearable! I love it, you are so inventive! Nice work! I will definitely keep this retouching in mind when I go thrifting! What fun pants! I'm glad you could save them. I, too, enjoy reading through C&C. She has a huge number of inspiring tutorials. Glad they helped you save these pants! Oh WOOOOOOWWWW!! I fell in love with these as soon as I saw them! You are clever - I would have been way to scared to chop them - but they look great now! They fit you so perfectly now, amazing! 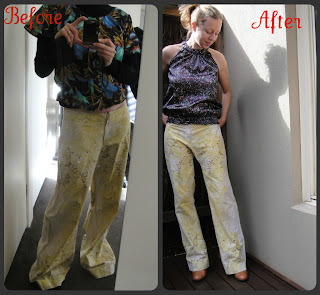 I have also always avoided too big trousers to refashion but I feel inspired now! ughhh you make that look so easy!!! I really wish I could have you sit with me and give me a tutorial! I just found some similar pants...but they were too tight!! I rarely have the "it's too big problem" haha Love it! thank you for linking up, don't forget to link up tomorrow!! !